The problem of getting enough gain to use a moving coil phono cartridge with a preamplifier designed for moving magnet cartridge use without lots of noise is easily solved using a Lundahl MC step-up transformer. These transformers are used by several high-end audio manufacturers for this same purpose. The Basic Kit was profiled and praised by Art Dudley in Stereophile magazine in 2007. There are two levels of the Moving Coil Phono Step-Up Kit available, the Basic and Premium kits. 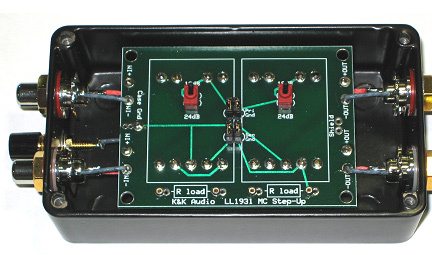 These kits both provide two channels of transformer-based MC Step-Up for stereo reproduction. See http://www.kandkaudio.com/applications-guide/ for more applications information. The Basic Kit now employs the new Lundahl LL9226 for improved sound. This transformer is a rethinking of the already very good LL9206, incorporating what was learned in the development of the LL1931. It offers across-the-board better perfomance than its predecessor. The Basic unit can be set up for 14, 20 or 26 dB of gain when equipped with LL9226 transformers. Alternatively, the Basic kit can also be supplied with LL1678 transformers for 18, 24, or 30dB of gain, if you have a particularly low output MC cartridge or low gain phono preamplifier. The gain configuration is achieved by soldering jumpers on the PC board supplied with the kit. Sockets for resistors on the secondary side of each transformer are provided on the PC board so that the user can optimize resistive loading for the best sound. The Premium Kit is supplied with the new LL1931 MC step-up transformers. These were developed by Lundahl in conjunction with K&K Audio as a higher performance alternative to the LL9206 and LL1678. They use the same amorphous cobalt core material, but are substantially larger. The coils are wound with Cardas “6 nines” high purity copper wire. The design was optimized for low to medium output MC cartridges and the sonic performance with these cartridges is exceptional. The LL1931 provides 18dB and 24 dB step-up capability that is switch selectable, A higher step-up ratio version of the LL1931, the LL1941, is also available for very low output cartridges or for use with low gain phono preamps, yielding 24dB and 30dB step-up. For the Ultimate in MC Step-up the LL1931, LL1933, and LL1941 are all available wound with high purity silver wire as an option. There is also grounding flexibility designed into the kit to allow the best performance with different types of tonearm cabling. Sockets for resistors on the secondary side of each transformer are provided on the PC board so that the user can optimize resistive loading for the best sound. The kit includes connectors, transformers, PC board, wire, hardware, and enclosure. The enclosure is a black powder coated diecast aluminum case that provides exceptional RF shielding. The wire used in the kit is the excellent AG23 silver wire made by DH Labs. The RCA connectors are rhodium plated Cardas units. The enclosure is physically small (5.5″ x 2.75″ x 1.75″, 14cm x 7cm x 4.5cm), so it can be located conveniently. 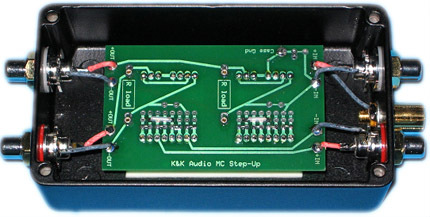 The K&K Audio MC Phono Step-Up Kits are not really “newbie” kits, but can be constructed successfully by anyone with good mechanical skills and some soldering experience. Included with the kit is a step-by-step instruction manual. K&K Audio stands behind you as you build with telephone/e-mail support. However, if you feel that this kit is beyond your skills/inclination, we offer it assembled to your specifications, as well.